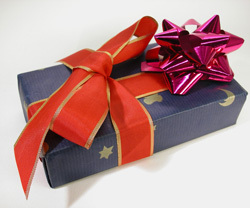 What’s your spirit like when it comes to gift giving and receiving? My latest experience in gift giving was buying a gift for my sister. I really had no idea what to buy; she is not the easiest to shop for. So I bought her a gift that keeps on giving – an iPod. What do I mean by a gift that keeps on giving? Two days after I gave her the fabulous iPod, she has used it maybe twice, and I pretty much use it every day! This is one of those good news/bad news gift-giving stories. Good news: I have an iPod, and its name is Shiny. Bad news: My sister got half a gift, and she didn’t know it until she got it…and then lost it! 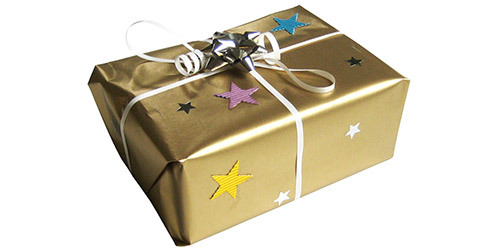 The reason for my story is that I want to help you get in the right frame of mind about gift giving and receiving. #1: It’s the thought that counts! When receiving a gift, you should always remember the only reason you were given one is because that person cares about you. Wait!! Don’t stop reading. I’m not getting preachy. All I’m saying is the best way to receive a gift is to always be gracious and grateful. I’ve given a bad gift before, and after I realized that they hated it, I felt worse about it than they did. It’s OK if you don’t like it, just don’t be mean about it. It’s not just about receiving gifts but also about giving them. And here is where the phrase “What goes around, comes around” becomes relevant. The best gifts are the most thoughtful ones, so when you are out shopping for a gift, put some thought into it. You don’t even have to make it about buying a present. 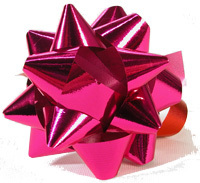 You can make a gift or make spending time with a person a gift too. Remember, everybody loves hanging out with people they like, and memories will last longer than any gift you can buy. There are certain gifts we receive every year. I have yet to understand why, but now all I can think when I open a present and see three bars of fruity soap, and foot lotion is “Do I smell? Seriously, do I have a B.O. problem?” Because it’s happened more than once, and it’s getting a little old, I’m going to be presumptuous here and assume that recurring gifts, like bath products, are a sign of lazy gift giving. And I’d like to think that I don’t smell. What else do I have to say about this? Make the effort, don’t be lazy and get them something else — anything else. And NO BATH PRODUCTS for me, please. OK, I’m going to put it out there. Are you ready? Sometimes the majority of gifts you get are the exact opposite of what you want. I know, I’ve been there, and it’s no fun. It may have happened to you as a kid, or it’s still happening to you now. Truth is — this is a reality we all must face. All I can say is, no matter how bad the gift is, it is still better than not getting anything at all. I don’t have to tell you how fortunate you are to be getting gifts in the first place. You all know that already! And with that, I’ll spare you the preaching about how grateful you should be. So, be happy you are loved and that someone thought of getting you something, no matter how stupid you think it may be. As I mentioned, my sister is not the easiest to shop for. Why? Because she never tells me what she wants! When someone asks you what you would like as a gift, suggest a few things. There is always something that you want, whether it’s a new shirt, CD or an accessory. Make sure you speak up or you’ll never receive what you secretly dream of. At the same time, don’t go overboard with the requests, or you’ll get nothing. Trust me. This is my story and I’m sticking to it! Catch Joy Olimpo on YTV’s GirlzTV. And one of our good friends, Joy has joined Faze on exciting trips to places like San Diego and Tobago!! !